In the year 2000 two young Chilean men, Diego Zúñiga and Sergio Sánchez, who were investigating and studying the UFO subject decided to create a publication through which they would share their work and ideas and establish a fruitful dialog with the best investigators and students at an international level. The result was “La Nave de los Locos” (The Crazy’s Ship). 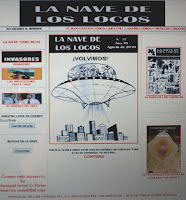 In spite of its name, that was an expression of good humour, “La Nave…” has been one of the most serious and reliable publications about the UFO subject in Latin America. Zúñiga and Sánchez made the great sacrifice to sustain it throughout 6 years, when in 2006, they published the last edition. At that time we regretted that that was happening. And sincerely we missed the presence of the good Chilean Ufology. That is why now we really celebrate that Diego and Sergio have returned with all their capacity, knowledge and good criteria once again publishing “La Nave de los Locos”. We give them our heartfelt welcome! And we say: long live to “La Nave de los Locos”, serious and responsible Ufology from and to intellectualy honest Ufologists.